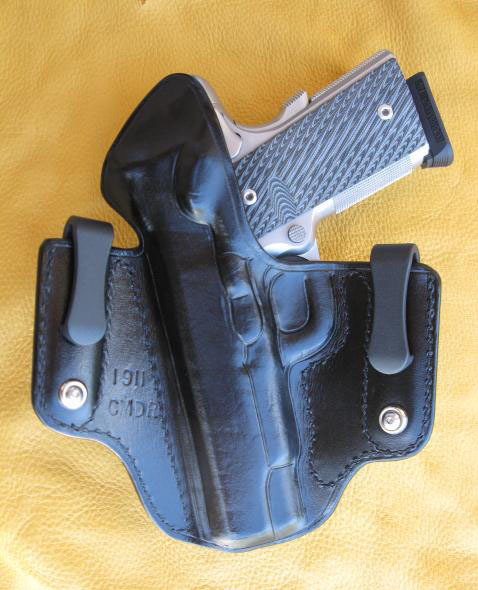 This IWB holster is designed specifically for front appendix carry, at a 1 o’clock to 1:30 position for a right-handed shooter (with 12 o’clock being the belt buckle). 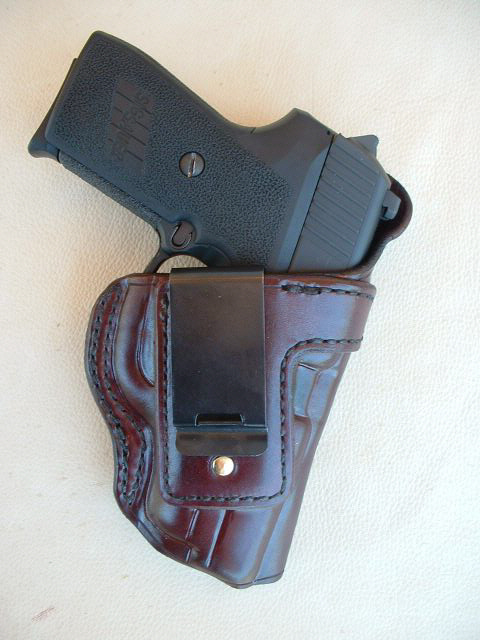 The holster is a straight vertical drop and sits low in the waistband. 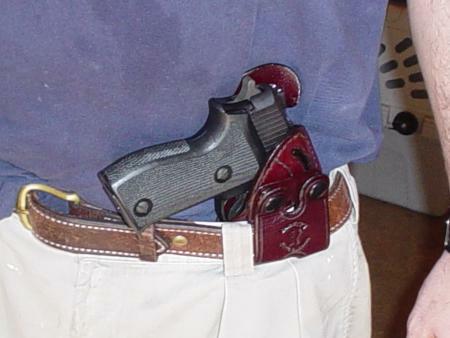 This ride height, combined with other unique features, work in conjunction to conceal a full-size pistol in this carry position. 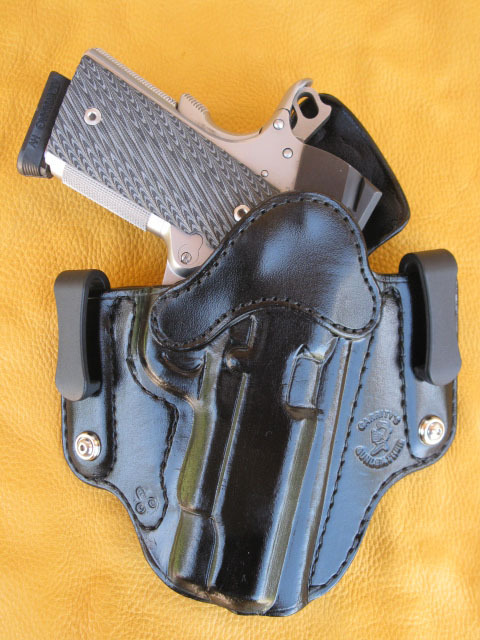 The holster features a kydex reinforced mouth-band, full length reinforced sight track, the back covered in suede for comfort, (similar to my In-Cognito Deluxe), and customer’s choice of full or abbreviated rear shield, and closed or snap-on belt loop. 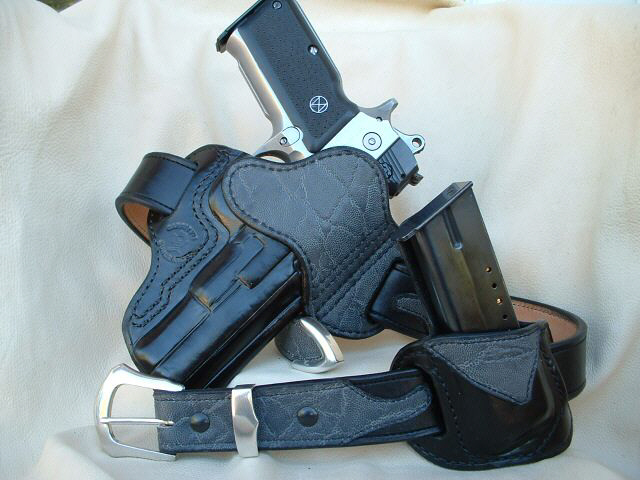 A good firm double thickness belt is necessary as the foundation for this carry system, more-so than with any other holster. 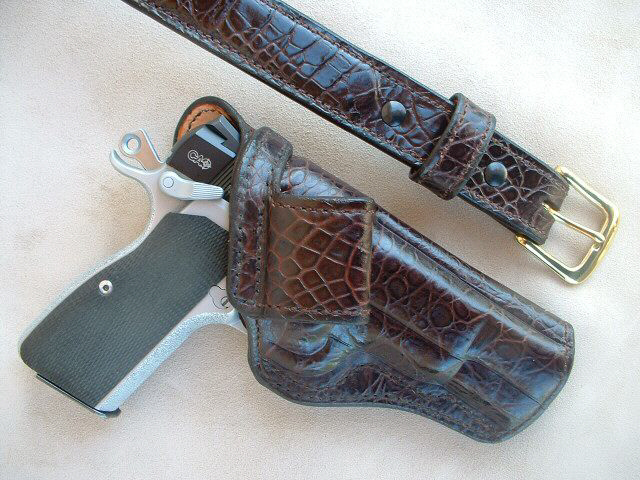 Do not even think about wearing this holster with a cheap, flimsy, off-the-rack belt. 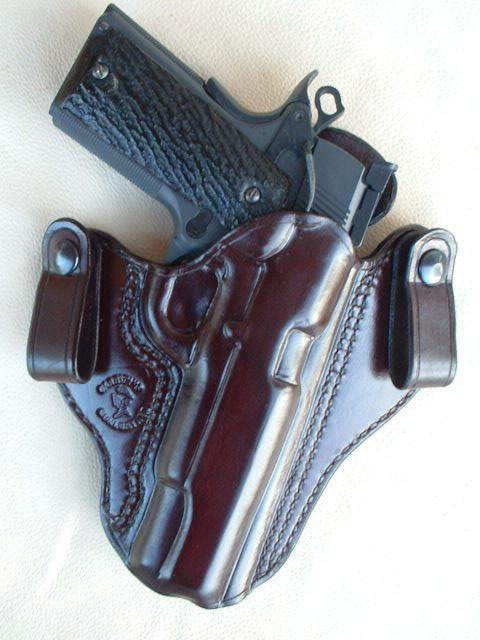 NOTE: Due to the carry position and draw techniques associated with this holster, it should only be used by trained and experienced shooters, and is not recommended for those new to concealed carry or firearms handling. Garrity's Gunleather Triskel Holster is a truly unique design that offers three carry modes in one holster. 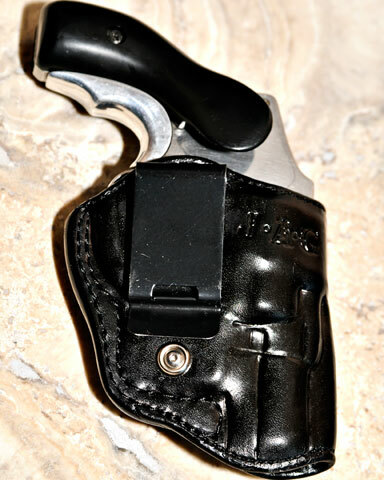 By attaching the kydex belt clips inside the holster pockets facing forward, it can be worn as a conventional IWB. Reverse the clips in the pockets so they face to the rear and the holster can be clipped onto the belt as an easy on/ easy off OWB strong-side belt holster. Or attach the clips to the outside front of the holster without using the pockets. This creates a gap between the top of the clip and the front holster body. By tucking your shirt between the holster and behind the clips, you can now conceal with your shirt tucked in and it serves as a 'tuckable" holster. True triple duty from one holster! Clips are supplied courtesy of Comp-Tac. For added versatility or more discreet IWB/Tuckable carry, any of Comp-Tacs four styles of kydex clip, available on order from them, will work with this holster. However only the standard belt clip supplied will permit OWB carry. 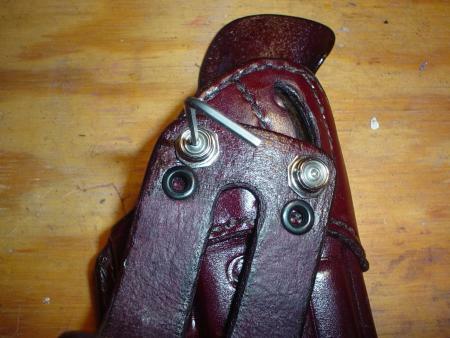 For a stable fit, a good double thickness belt which the clips were designed to work with is recommended. Every effort has been made to make this the most comfortable, concealable, secure, and stable I.W.B. holster available. The wide flaring, slim profile, and dual belt loops front and rear of the holster body stabilize and distribute the weight of any handgun. (This rig was originally designed around the short top-heavy HK P7 series). A thin 6 oz. holster body with high scalloped front eliminates the added bulk of a reinforced mouthband while still permitting adequate one-handed reholstering, and a rear body shield protects the wearer from the pistols slide, rear sight, and any manual safeties. Belt loops are removable via allen head screws to allow loops of different widths, colors, or exotic hides to be interchanged. 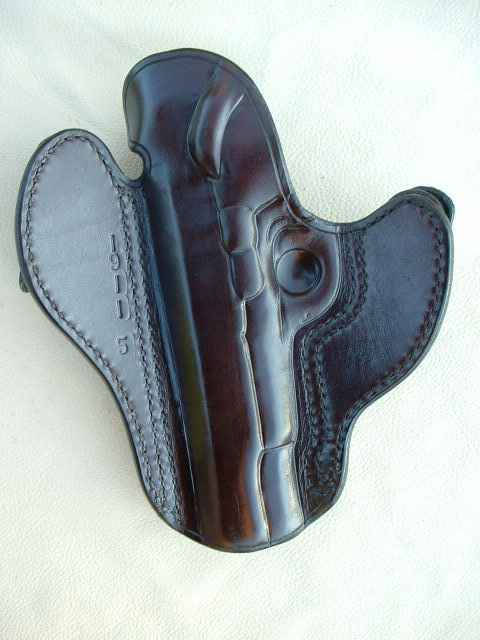 A thin buff-colored suede backing covering the entire rear body of the holster reduces shifting, and prevents the holster from "sticking" to the wearer if worn against bare skin on a hot day. This option adds very little bulk and aids in wearer comfort. 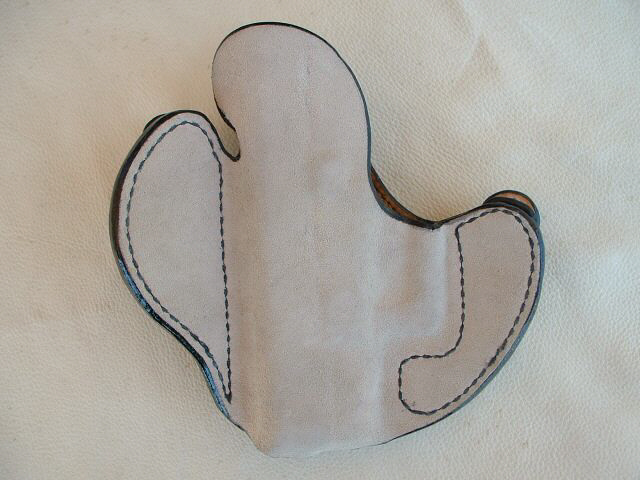 Underneath this suede backing is a thin plastic membrane which protects your pistol from perspiration. 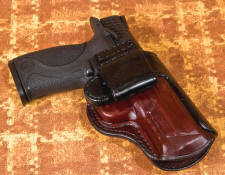 A kydex-reinforced mouthband is also offered on this holster. A thin piece of molded kydex is sandwiched between two pieces of 3 oz. leather to form the front of the holster. This greatly stiffens the mouthband to prevent holster collapse for one-handed reholstering, while adding virtually no bulk. The combination of kydex mouthband and suede backing creates the additional benefit of a smooth leather lining inside the front and rear of the holster. 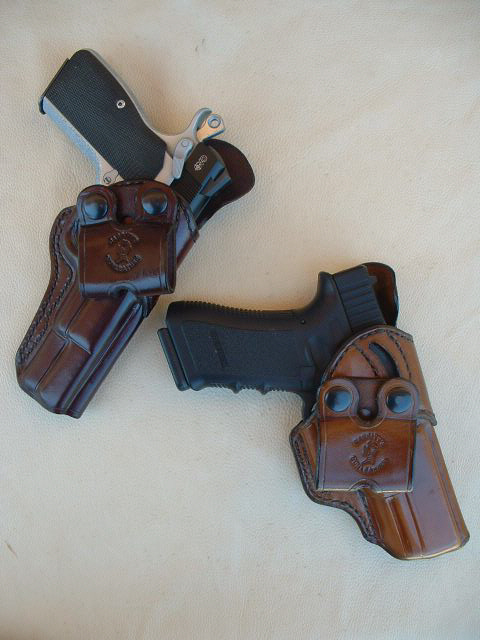 This continues to be my most popular selling holster and is my daily concealed carry rig. A completely reinforced mouthband I.W.B. that allows total adjustment to the wearer's desired angle of cant, from 25 degrees forward rake to 25 degrees crossdraw, and any angle in between. This is accomplished by allen-screw afixed snap-posts with a curved slot cut into the mouthband that the right-side screw attaches to. The left screw is stationary and acts as the pivot point, while the right can be adjusted along the track to the preferred cant and then screwed firmly in place. The belt loop features two pairs of attachment holes so the same loop can be used with 1 1/2 or 1 1/4 inch belts. The belt loop is also slotted in the center for placement over a pant's belt loop for even greater versatility. This I.W.B. 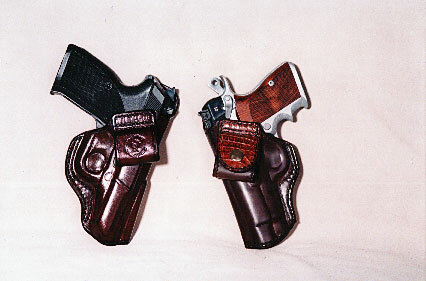 holster is designed to ride as low as possible in the waistband while still permitting an adequate initial grip. 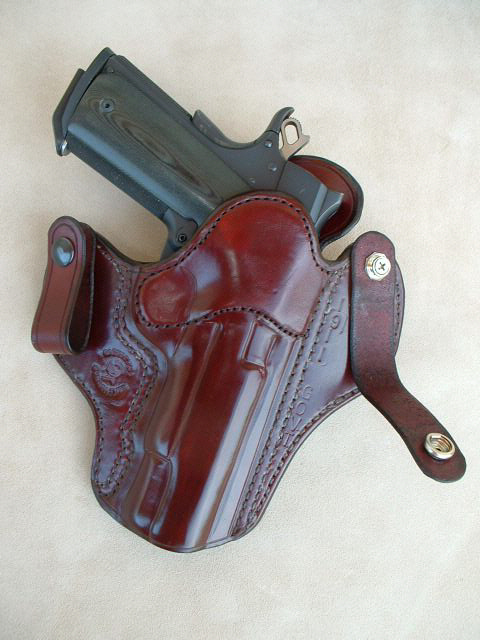 It features a partial wrap-around mouthband to hold the holster open for re-holstering while still keeping it single layer thin and smooth on the back for comfort. Available with sewn-closed loop that the belt is laced through for maximum stability, or one-way snap closure loop for easy removal without undoing the belt. Belt loops are kydex reinforced. in genuine shell cordovan with alligator belt loop at additional charge. Basically a clip-on version of The In-Discernable IWB. For years I talked customers out of clip-on holsters until I found this metal clip with a claw or hook cut in it's center that stays put and really grips the waistband, even without a belt.